This week's space is filled with a stack of books. They are on loan from my local library and look well-read. They have serious titles like "Metric pattern cutting" and "Pattern making for the home couturier". I am reading about the basics of creating patterns. Now don't get me wrong, I'm under no illusion as to the complexity of pattern-making - I don't really see a line of Hoppo Bumpo evening-wear in my future. I am, however, enjoying looking at how pattern pieces for various styles are created and how shaping is achieved. 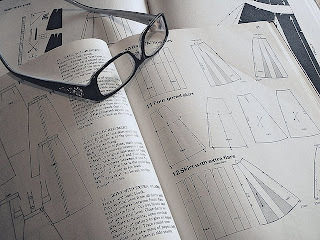 Its handy to have a point of reference when you are altering and sewing from commercial patterns. That said, I'm enjoying the texts with a certain amount of caution. You see, upon spying books full of beautiful line drawings, 3-year old Bargy gushed: "Sank you for borrowing the colouring books, mummy". Oooh - I'm sure no-one would mind too much if they were creatively coloured in... maybe? I'm forgetting do you have a copy of Fit for Real People? I have that one. I don't have them myself but I've heard very good things about the Elizabeth Liechty ones. They are expensive but 2nd hand ones do crop up. Do you have a quarter/fifth scale ruler? We had them at college, allows you to draft the patterns out the book in, surprise surprise, one quarter or one fifth of actual size. Good for practicing with normal size paper when huge isn't an option. Oh my goodness, don't let Bargy near them with his crayons! In the event that there is a colouring frenzy, return the books to the library post haste, with an indignant complaint that *someone* has let their children near the pattern books! Interesting for sure, but those titles scare me a little! A little creative colouring in would be a lovely addition to serious books! I fear an 'oh oh' moment coming on. I also fear an information overload. Way too technical for me. Visiting creative spaces and it's so nice to be able to find nice references at the library...I haven't tried yet after moving to Italy...I wonder if the public libraries work the same way here! I suspect Bargy might be right - with a little colour those dull old dresses and pants would be much better! It all looks very technical. Wouldn't it be nice if patterns just adjusted themselves? I agree with Karen, maybe Bargy would do them good! Better you than me, my mind does wander considerably when reading about anything technical but I wish you well in your endevours. I get inspiration from old girls annual books-the clothes in the cartoons are the cutest old style things...maybe photocopy some pages for Bargy? But if he does get his mitts on them maybe it won't be so bad...I dropped a library book in a bath once, then trying to dry it in front of a heater burnt the page edges-warped blackened pages-i was beginning to feel a bit Mr Bean so I gave up and took it back and the library staff did and said nothing! !